I will have my camera back up and running, with back up batteries soon. I was able to find two pictures of the process of making the ganache though. I will incorporate them here. Personally, white chocolate isn't my thing. It was invented by Albert Nestlè to deal with his excess of cocoa butter after he invented the dry process cocoa recipe. He tried lots of things, face creams and such. Then he hit upon the idea of using the cocoa butter as a base for a vanilla confection. I have tried the expensive high cocoa butter white chocolates and frankly, I can't tell the difference between them and the Guittard buttons that I buy at a cake decorating store. Some purist might argue things like mouth feel, but, dude, purists are into dark chocolate. The people who love the stuff, love the stuff. Here's my recipe for the ganache. 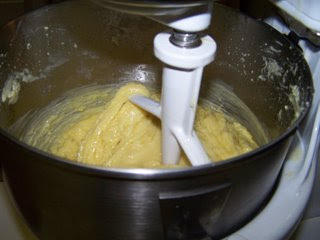 Put the white chocolate, the butter, and the halved and split vanilla beans into the bowl of a high power stand mixer. Place over simmering water (being careful to not allow any water into the ganache) and stir occaisionaly until melted. Using the paddle attachment, begin to stir the melted chocolate and butter mixture. When it is absolutely smooth and you're certain that there are no lumps of white chocolate or unmelted butter, add in the egg yolks one at a time. 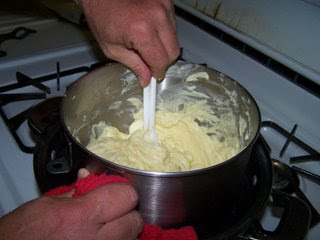 The mixture will break, it will separate into curds and liquid. Do not despair. Keep mixing at the low speed until it reforms into a liason. Add the vanilla extract. At this time also add any flavoring. On one batch of these last night I added crushed peppermint candies. It made the astonishingly gorgeous April's eyes cross it was so good. When the liquid and the flavorings are added, beat on highest speed for ten minutes. Turn into lined pans, cover closely, refrigerate overnight. Today is all about rolling the ganche into balls to be dipped. When I get the battery situation with the camera fixed I'll take some pictures of the rolling process. Regardless of the type of truffle, it is the same. 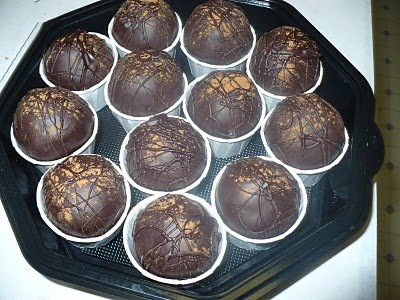 Take the ganache, roll it into balls, cover closely and refrigerate to set them firm before dipping.